Sabina-Francesca Foisor described herself as “sad and excited at the same time” after winning a brilliant attacking game that made her the US Women’s Champion in the same year her mother passed away. Nazi Paikidze lost with White to 15-year-old Jennifer Yu, who has taken giant killing to a whole new level. 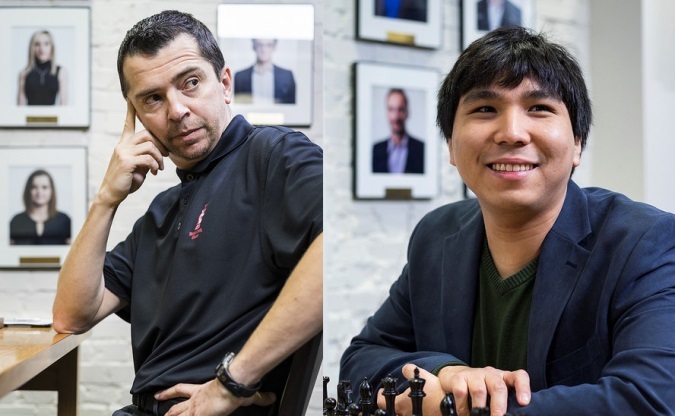 In the overall event Wesley So and Alexander Onischuk face a rapid playoff on Monday after Wesley’s gamble of taking a 14-move draw against Daniel Naroditsky went unpunished. For the best broadcast experience Go PREMIUM during the US Championships. It's $9.99 a month or, for just one more day, $89 (€89) per year. You get: no ads, unlimited chat, unlimited database & opening tree, cloud analysis and access to thousands of hours of videos and everything else chess24 has to offer! 27-year-old Sabina-Francesca Foisor is the deserving US Women’s Champion after she finished the tournament in true style. Previously she had won all six of her games with the white pieces, but going into the final round she had two losses and two draws with Black. 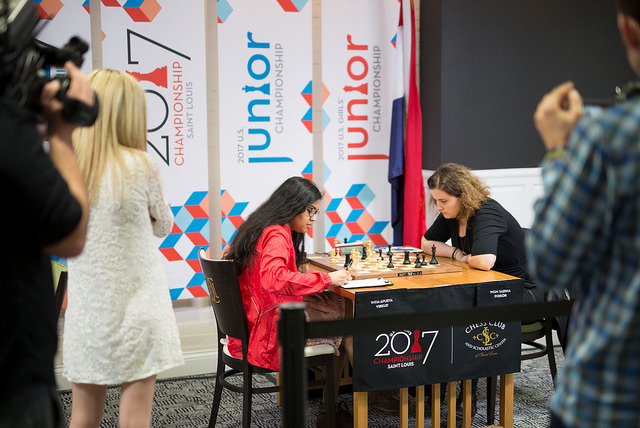 Since she shared first place with defending Champion Nazi Paikidze, who was playing White, she knew that she really needed to try and win with the black pieces against Apurva Virkud. In the end it couldn’t have gone any better. For some years we had this goal to be in the top 3… I think she’s happy, there where she is, she’s happy. For more on Cristina Foisor be sure to check out GM Elshan Moradiabadi’s tribute at the US Chess Federation website. 32…Bc4! 33.Qe1 Bxf1! 34.Kxf1 Qa6+! 35.Kg2 Qd3! and Jennifer would later win the critical e4-pawn. After another pawn dropped Nazi Paikidze had already conceded the title when she offered a draw, but Jennifer correctly played on and the draw offer had soon changed into resignation. 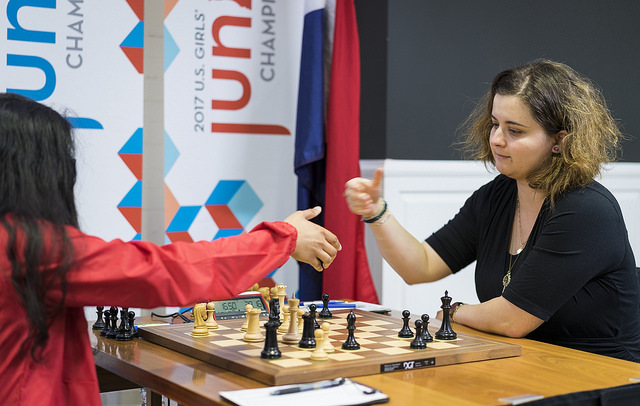 The 15-year-old had lost three games in St. Louis, but she’d also beaten the top three seeds Irina Krush, Anna Zatonskih and now Paikidze! Sabina’s my friend and I’m really happy for her. She had a phenomenal performance and she deserves it. I think I got a good position from the opening and somehow she outplayed me… She didn’t make any mistakes. She outperformed herself and she was really the only one who could play better than she could suspect, and that’s why she’s a deserved winner. Afterwards the young players in the women’s section enjoyed themselves with some bughouse chess (two games are played side-by-side and when you capture a piece you hand it to your partner, who can put it on their board instead of moving a piece) and an unusual “boardless” chess variant! 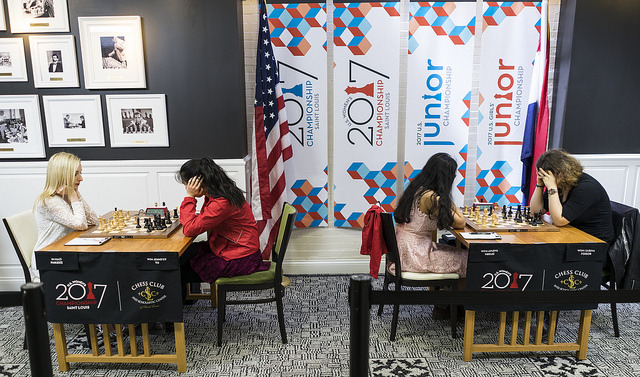 The overall US Championship title is still up for grabs after a tense and controversial 11th round. I honestly didn’t expect the Berlin from Wesley. I thought he’d play the Sicilian, in which case I would repeat 6.h4!? – full disclosure – or the French, or something like that. In my mind I knew about this forced draw, of course, and I would consult myself and act on how I felt, but of course I don’t have anything against the Berlin and, to be frank, I’m a bit out of gas at this point. I have two papers due tomorrow (at Stanford University), which I have to work on all night tonight, and so I figured given the circumstances and given the way I’d played in the latter half of the tournament, it would not be a huge crime to do something that’s perhaps somewhat unprofessional but within my rights. 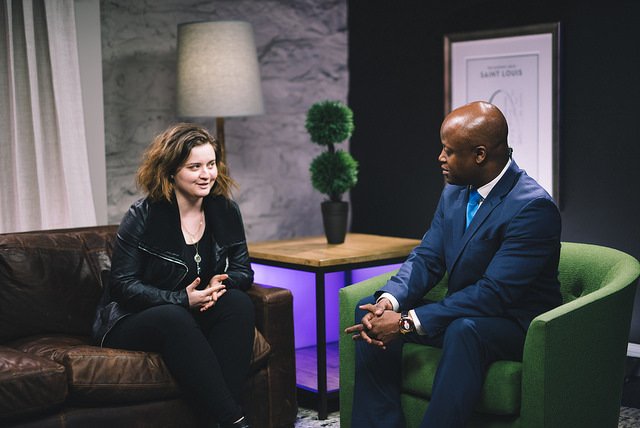 Wesley, surprisingly, left the building before talking to Maurice Ashley, and his choice was also something of a surprise. While his 67-game unbeaten streak has partly been built on extremely pragmatic choices, this one had a substantial element of risk. 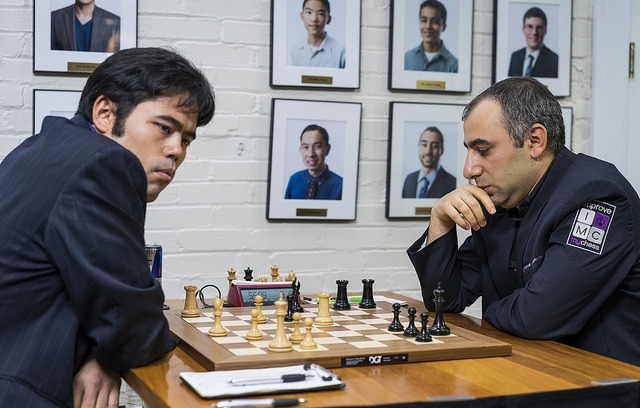 He took it knowing that while Varuzhan Akobian and Alexander Onischuk would struggle to beat Hikaru Nakamura and Gata Kamsky with the black pieces, if either of them managed they would become the US Champion. Wesley’s hopes of winning his first title were entirely out of his hands. 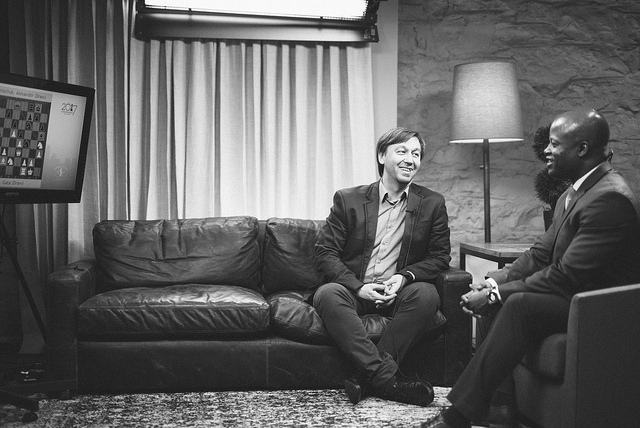 My thought process: I wanted to just make sure it was a decisive game… I didn’t want a draw. Var isn’t going to beat Wesley in a playoff. I just wanted to make sure it was messy and decisive one way or another. I was very happy with the opening, then at some point I got a little too optimistic and made a couple of moves too fast. He’d missed in advance that 26…Qxa2? 27.Ra1! is not an option, and here he panicked and exchanged queens. Soon he had an ending a pawn down that was probably holdable, but was very tough to play against a player of Nakamura’s calibre. In the end Varuzhan put up little resistance, but instead 26…Qa7! would have kept the game very much alive. 27.Bxd5? fails tactically to 27…Bc5!, when the pin would cost White a piece. 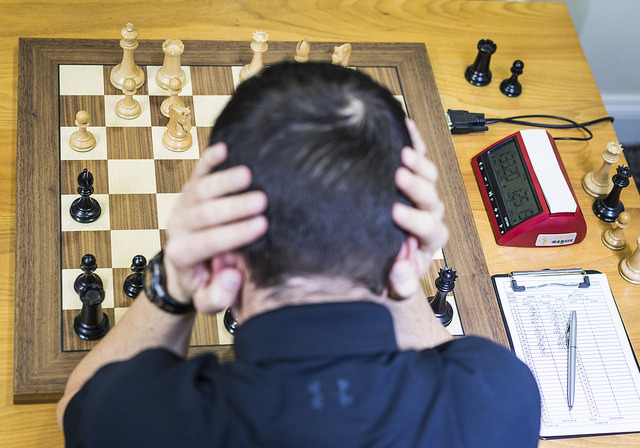 Alex – he’s still a very strong player, but he doesn’t have the same motivation… He’s still trying to compete but he doesn’t consider himself as strong as he once was… For Var, you could consider it the most important game of his chess career. This morning I considered playing the Sicilian, but some good friends of mine just told me to play whatever I knew best and go for a complicated position. Five minutes before the game I remembered he played this line… If you’re not prepared you need to play a quiet game and see what happens. I thought now everything depends on me and now 90% if I win this game I’ll be the US Champion… Should I play the moves I consider to be best, or should I take a little more risk? That’s why I was down on the clock. In the end we didn’t get a full conflagration and instead the players agreed a draw after reaching the required 30 moves. 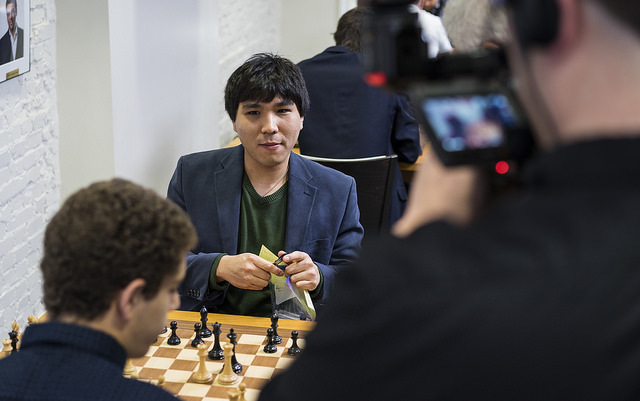 That meant Alexander was heading for a rapid playoff against Wesley So. 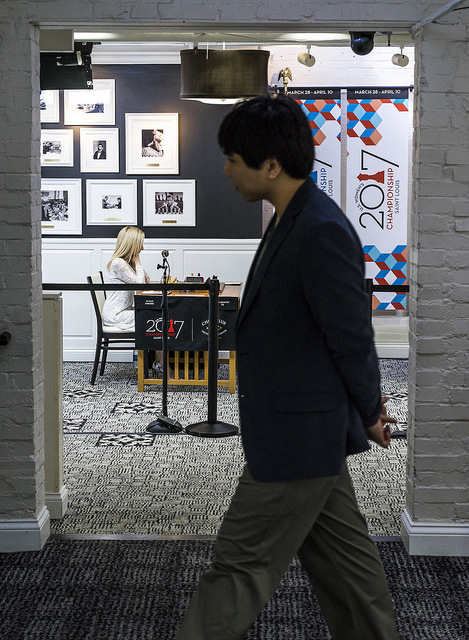 Those games took the full focus of the chess world, though Fabiano Caruana’s win over Ray Robson was certainly the day’s most spectacular encounter among the men’s games. 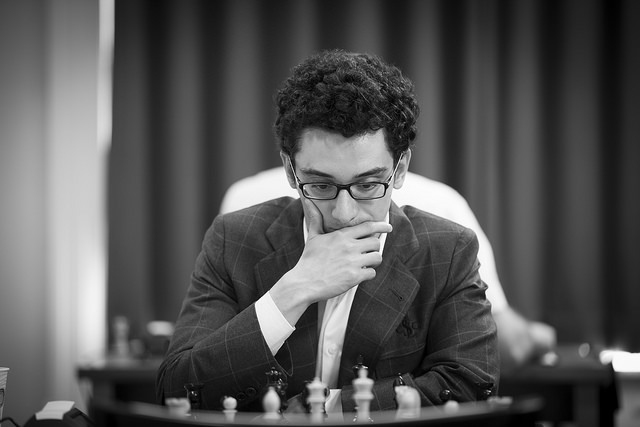 Caruana started the US Championship with five draws and then after the rest day came back with six decisive games. 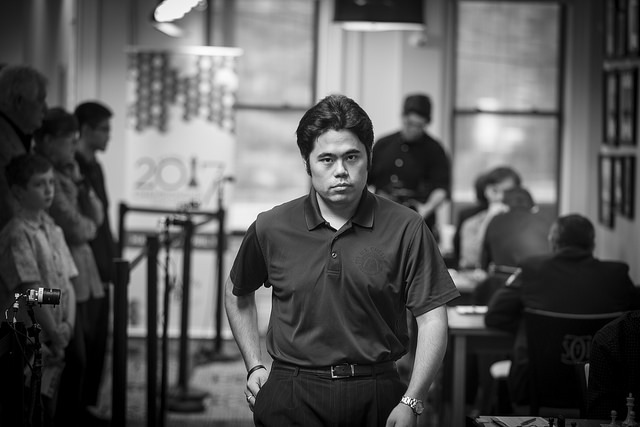 The two wins at the end gave a measure of respectability to his score, but Fabiano admitted, “I’ve played horribly this tournament” and felt all his fellow top players, including Wesley So, had been “on shaky form”. 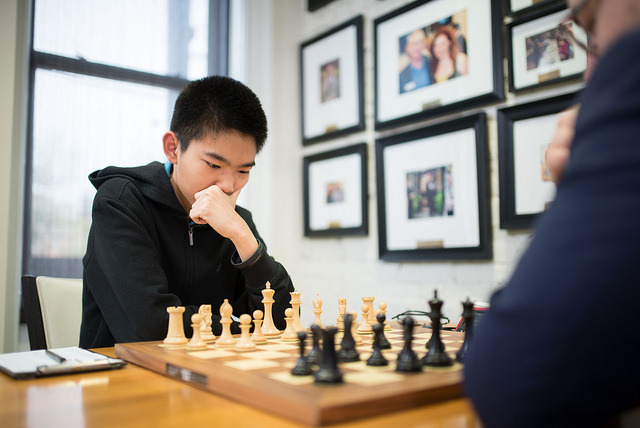 The regret for Fabiano was that despite that if he’d done “the most basic thing” and won his game two pawns up against Akobian he would have been the outright champion, or at least playing a playoff. Fabi’s queens won the day. After seven rounds I actually got really ambitious, but suddenly I ran out of batteries. I didn’t have any energy to continue. The format of the playoff is for Wesley So and Alexander Onischuk to play two 25 minutes games with a 5-second delay i.e. the clock doesn’t start ticking down until 5 seconds after you make a move, but you don’t get an increment and so can’t build up extra time on your clock. If those two games are drawn the players will go straight to an Armageddon game, where the player with White will have more time but a draw in the game will make the player with Black the 2017 US Champion.